Rebecca Adlington OBE (born 17 February 1989) is a British former competitive swimmer who specialised in freestyle events in international competition. She won two gold medals at the 2008 Summer Olympics in the 400-metre freestyle and 800-metre freestyle, breaking the 19-year-old world record of Janet Evans in the 800-metre final. Adlington was Britain's first Olympic swimming champion since 1988, and the first British swimmer to win two Olympic gold medals since 1908. She won bronze medals in both the women's 400-metre and 800-metre freestyle events in the 2012 Summer Olympics in London. On 5 February 2013, Adlington retired from all competitive swimming, at the age of 23. Since retiring as a competitor, she has worked for BBC TV as a swimming pundit at the Olympic Games and World Aquatics Championships, and made various other media appearances. 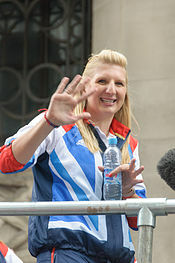 Adlington was born in Mansfield, Nottinghamshire, where she attended The Brunts School. She started swimming with Sherwood Colliery Swimming Club, and was selected for the Nottinghamshire County Elite Squad (Nova Centurion Swimming Club). She swam in local swimming leagues for Nottingham Leander Swimming Club, having taken part in the National Speedo 'B' Final in May 2010. Adlington's great-uncle was former Derby County goalkeeper Terry Adlington, and she is a keen Derby supporter. In 2005, Adlington's sister, Laura, was affected by encephalitis, an inflammation of the brain. Her sister recovered over time, but its impact inspired Adlington to say in 2012: "It made me more determined. It makes me train harder". Adlington became an Ambassador of the Encephalitis Society in 2009, to help raise awareness of the illness. In 2014, Adlington married former swimmer Harry Needs. The couple had a daughter together, Summer (born 2015). In March 2016, Adlington announced her separation from Needs. Adlington represented Great Britain in the 2008 Summer Olympics, competing in the 400-metre freestyle and 800-metre freestyle events. She was also scheduled to swim in the 4×200-metre freestyle relay but was rested in the heat and the team failed to qualify for the final. In the heats of the 400-metre freestyle, she broke the Commonwealth record with a time of 4:02.24. On 11 August 2008, she won an Olympic gold medal in the same event, with a time of 4:03.22, beating Katie Hoff of the United States in the last 20 metres. She was the first woman to win swimming gold for Great Britain since Anita Lonsbrough in 1960. She was the first British swimmer to win more than one gold medal at a single Olympic Games since Henry Taylor won three in 1908. In 2009, Adlington admitted she suffered with the expectation placed on her ahead of the World Aquatics Championships in Rome, and although she swam a personal best she was only able to win bronze in the 400-metre freestyle. She added a second bronze in the 4×200-metre freestyle. In her favourite event, the 800-metre freestyle she missed out on a chance for a medal and came fourth. In 2010, Adlington won the 400-metre freestyle at the European Swimming Championships in Budapest but again failed to win a medal in her favoured 800-metre freestyle as she faded to seventh. She won bronze as part of the 4×200-metre freestyle relay team. At the Commonwealth Games in New Delhi, she won a "bonus" bronze medal in the 200-metre freestyle, and was part of the English record setting 4×200-metre freestyle relay team that also won bronze. In the 800-metre freestyle, Adlington led from start to finish to win her first Commonwealth Games gold medal. In the 400-metre freestyle, Adlington won comfortably to earn a second gold medal and repeat her Olympic double. She ended the season ranked No. 2 in the 400-metre freestyle and No. 1 in the 800-metre freestyle. At the 2011 World Aquatics Championships, Adlington won the 800-metre freestyle gold medal, beating Lotte Friis over the final 50 metres, and silver in the 400-metre freestyle behind world record-holder Federica Pellegrini of Italy. At the 2012 Summer Olympics in London, Adlington won bronze in the 400-metre freestyle in a time of 4:03.01. and another bronze in the women's 800-metre freestyle in a time of 8:20.32. After the Games, Adlington said that she was done with the 800-metre race, and would not compete in Rio. Adlington set a new British, Commonwealth, European and Olympic record of 8:18.06 in the preliminary heats of the women's 800-metre freestyle on 14 August 2008. She went on to win the Olympic 800-metre freestyle final on 16 August 2008 in a world record time of 8:14.10, her second gold of the tournament, a full six seconds ahead of the silver medalist, and two seconds ahead of the former world record which had been set by Janet Evans when Adlington was 6 months old. At the time, this was swimming's longest standing world record. The Sherwood Swimming Baths in Adlington's hometown of Mansfield, where she began swimming as a child, was renamed the Rebecca Adlington Swimming Centre when it reopened after refurbishment in January 2010. The Yates Bar in Mansfield was renamed the Adlington Arms in her honour, although it soon reverted to its original name. In November 2008, Adlington was named as the Sports Journalists' Association's Sportswoman of the Year, receiving her trophy at a ceremony in the City of London from HRH The Princess Royal, herself a former winner of that award. On 14 December 2008, she was voted third in the BBC Sports Personality of the Year award. She was appointed Officer of the Order of the British Empire (OBE) in the 2009 New Year Honours list, followed in December 2009 by an honorary degree as Master of Arts from the University of Nottingham in recognition of her outstanding contribution to British sport. One of the Southeastern Class 395 high-speed trains, which are used domestically to provide a 140-mph London-to-Kent link and provided the Javelin shuttle service for visitors to the 2012 London Olympic Games, was named after Adlington. Several other British Olympians also received this honour. On 25 March, 17 April and 22 May 2014, Rebecca was a guest panellist on the ITV lunchtime chat show Loose Women. She was one of the contestants in Series 3 of The Jump, but withdrew on 7 February 2016 having dislocated her shoulder during training. At the 2016 Summer Olympics in Rio, Adlington formed part of the BBC presenting team for the swimming events, along with Helen Skelton and Mark Foster. She repeated this role at the 2017 World Aquatics Championships and at the 2018 European Championships, among others. Main article: I'm a Celebrity...Get Me Out of Here! Adlington participated in the thirteenth series of I'm a Celebrity...Get Me Out of Here!, which began airing on 17 November 2013 and was held in Australia. She finished in 6th place, being voted out by the public on 6 December 2013. Desert Island Discs BBC Radio 4 (14 June 2015) – Interviewed at length as the guest 'castaway'. ^ a b "Rebecca Adlington's profile at the Olympic Games 2012 official site". London2012.com. Archived from the original on 2 April 2013. Retrieved 22 April 2014. ^ "Video review – Adlington is GB's golden girl". BBC Sport. 24 August 2008. Retrieved 5 September 2008. ^ "Rebecca Adlington: Time right to retire from swimming". BBC Sport. Retrieved 5 February 2013. ^ "Open top bus parade to salute double Olympic gold medallist Rebecca Adlington". Mansfield Chad. 17 August 2008. Retrieved 18 August 2008. ^ "Sherwood Colliery Swimming Club". ^ "NOVA Centurion Swimming Club - Nottingham". 17 July 2014. Archived from the original on 17 July 2014. Retrieved 12 September 2018. ^ "Nottingham Leander Swimming Club". ^ "My Sister's Brush With Death Inspires Me". The Telegraph. ^ "Gold medal swimmer and TV star officially launch charity HQ". The Press. York. 14 March 2012. Retrieved 12 November 2013. ^ "Adlington sets sights on GB medal". BBC Sport. 10 August 2008. Retrieved 11 August 2008. ^ Anita Lonsbrough (11 August 2008). "Rebecca Adlington wins gold on a rewarding day for Britain – Beijing Olympics 2008". The Daily Telegraph. Retrieved 11 August 2008. ^ Will Buckley (17 August 2008). "Olympics: 'Dame' Rebecca arises with second gold". The Guardian. London. Retrieved 31 August 2008. ^ "Rebecca Adlington wins Olympics swimming bronze behind Muffat". Archived from the original on 30 July 2012. Retrieved 29 July 2012. ^ "Rebecca Adlington rules out competing at 2016 Olympics in Rio". BBC Sport. 23 September 2012. Retrieved 22 April 2014. ^ "Adlington storms to second gold". BBC Sport. 16 August 2008. Retrieved 16 August 2008. ^ "Mansfield to honour Olympic hero". Mansfield District Council. 11 August 2008. Archived from the original on 5 September 2008. Retrieved 5 September 2008. ^ "Rebecca Adlington Swimming Centre". Mansfield District Council. Archived from the original on 18 August 2011. Retrieved 3 July 2011. ^ "Adlington Arms awaits golden girl". The Independent. London. 26 August 2008. Retrieved 5 September 2008. ^ "No. 58929". The London Gazette (Supplement). 31 December 2008. p. 8. ^ "Hoy knighted in New Year honours". BBC News. 31 December 2008. Retrieved 31 December 2008. ^ Ben Lee (7 February 2016). "The Jump: Rebecca Adlington quits over dislocated shoulder, and Heather Mills is replacing her". Digital Spy. ^ Denham, Jess (13 November 2013). "I'm A Celebrity 2013 contestants: Rebecca Adlington to join Joey Essex in the jungle". The Independent. Retrieved 27 November 2013. Wikimedia Commons has media related to Rebecca Adlington.